Scott has been out pruning trees for a couple of days, but taking a nap now. It’s raining. AGAIN. Yesterday and the day before were filled with getting the trees in shape. There are 80 plus trees in our small orchard. Apples, peaches, cherries, plums, pears, mulberries, kiwis and elderberries are the fruit trees/bushes. Hazelnut, pecans, almonds are the nut trees. He got about 40% complete on the blueberries and blackberries before the rain hit. There are a few raspberry and grape plants around as well. I probably missed one or two in that list. The orchard is a favorite project for him. It’s a lot of work, but he loves it. We have a beehive back there also for pollination. We were at the Wytheville Farmer’s market this past Saturday. Got to meet lots of new people. A shout out and thanks for your patronage. March 9th is the next market date. We will have ground lamb and goat as well as some awesome soup bones. You get a free recipe card with each purchase. If you buy a whole or half lamb you get the All Lamb Cookbook. It contains recipes for every cut of lamb in your package. We want to make is easy for you to get the most out of your lamb. I will admit that the Indian Lamb Curry is my favorite. It’s made from the boneless shoulder roast cut into bite-sized pieces. March 23rd market we will have ground beef as well. Tomorrow we are going to pick up a freezer we loaned out last year. We need it for the beef we are going to have soon. I’m a little bummed about the need that drove the event. Sometimes it’s hard to maintain peace when you have a homestead farm business. Here’s the story. We have a small herd of Normande cows. As I mentioned, I’ll be talking in great detail about that breed today. The purpose of the cows is to provide wonderfully nutritious milk so we can make wonderfully nutritious cheese. In order to make that happen, the cows need to have a calf every year. We milk them for about 9 months and the other 3 months we do not. With the birth of a calf in the spring, the milking process starts again. It’s a continuous life cycle. In order to tell this story properly I need to make a distinction between the cows, the goats, the sheep. Goats and sheep are cute, especially the kids and lambs, and we watch them play and enjoy their beauty. But they are not pets. We have very little hands-on daily interaction with them. The goats get their hooves trimmed regularly and, in the spring, we comb out the cashmere. Otherwise, the goats and sheep pretty much take care of themselves. As far as the cattle, we have the milk cows in one herd. Then there is another herd comprised of steers that resulted from the annual birthing of calves. We grow them out for beef. The bull hangs out there as well until we need him. The steers pretty much take care of themselves as well. We often watch them grazing peacefully but are not physically interacting with them so much. The milk cows are unique. We interact with the milk cows – just about on a daily basis. These cows are not pets, but there is a special relationship or bond that develops with them. We pet them and hug them and talk to them. Cows are very peaceful animals. It is a pleasure to simply watch them graze. One of the reasons I wanted a milk cow was the experience of peace while sitting beside this beautiful creature and performing the action of milking. We bond with all of our animals. However, the bond with the milk cows is deeper. The difference is that the other animals are raised specifically for meat as food. The milk cows are raised for the luscious milk they make. They get extra-special attention. Today, for the first time in my experience on the farm, we had to cull one of our milk cows. She was gentle and calm as they all are. She had intelligent eyes and a beautiful coat. I’ll talk more about the Normande coloring in a bit. We put a halter on her and led her onto the trailer. She was only slightly adverse and it didn’t take long to get her on the trailer. When we arrived at the processing facility, she was lying on the floor of the trailer not seemingly traumatized at all. Once the door was opened, she got up and Scott led her off the trailer. She got a little antsy at that point when we wanted her to go to an unknown place, but she shortly cooperated. Upon beginning the return journey home, we were both quiet and introspective. It was hard. I think it is the hardest thing I have ever done so far. I’ve seen the aftermath of a coyote attack on our lambs. I found dead lambs and goat kids that perished for reasons unknown. Last year we lost our oldest breeding ewe and her lambs, likely triplets. This past fall we culled an older ewe that twice had issues birthing her triplets. So, what happened. Lilly was 7 years old. She had a calf in 2014 and she had a calf in 2015. She hasn’t had one since. After more than seven months with the bull this year, she was still cycling. We had to let her go. She was consuming massive amounts of grass and hay and not doing her part to ensure our small enterprise would continue. Perhaps there were extra steps we could have taken to get her to stand for the bull. Or perhaps she had ovarian cysts and could have been treated by the vet but that comes with the possibility of recurrence. I’m sure I will continue to doubt my decision to cull her from the herd. But I stand firm in that it was a decision that had to be made. I had no idea it would be so hard. I was in tears and indeed am tearing up now at the loss of this animal. We hold in our mind the purpose of every animal on our homestead. Each contributes to the whole process of sustainability and diversity on our farm. They must contribute or they must go. At this point I’m pretty sure I’m never going to get used to losing my milk cows. I can’t help but bond with them. And I will cry each time their life with us is over whatever the reason. I hope this isn’t too much of a downer but I feel it is important to honor her life and to share our feelings as we move forward on the homestead. It’s not always roses and butterflies. Thank you for your patience with me as I grieve a little. 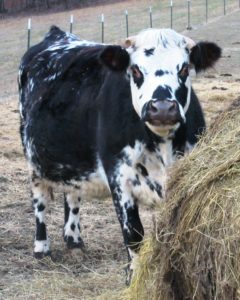 One way I want to honor her is to share the wonderfulness of her breed and why we chose these cows. It all started because I like to drink milk but did not want pasteurized milk. And cheesemaking has always been a passion of mine since I first learned how to make it back in 1993. The original plan was for one or two cows. So, we researched and researched. We wanted the milk but also knew to make that happen there would be a calf every year. That means we needed good beef as well. Because our values revolve around living close to and in harmony with nature, we wanted a breed that would do well on pasture without supplemental feed. Finally, we purchased our first cows in the fall of 2011. We bought two for milking and one for beef. I was already enamored with their unique coloring. And as we worked with them, I fell even more in love. Almost all cows have a deeply peaceful quality about them. This breed takes that quality to the next level. It was a defining moment for us in the evolution of our business aspirations. These cows were to become the centerpiece of our homestead. As the name implies, the breed comes from Normandy, a North–Western region of France. Since Normandy is famous for its Viking influence, many people believe that the breed descended from the cattle the Vikings imported. For over 1,000 years these cattle evolved into a dual-purpose breed to meet the milk and meat needs of the residents of Northwestern France. During the Allied Invasion of Normandy beginning on June 6, 1944 through July 1944, the breed was nearly wiped out. But today they are alive and well. As of 5 years ago there were about 3 million Normande cattle grazing on French pastures, with large numbers in the regions of Normandy, Brittany, and Maine, as well as in the Ardennes and the Pyrenees. Although popular for their beef, they are primarily milk producers. Have I mentioned that these are gorgeous cows? They have distinctive eye patches. There are three characteristic coat colors sometimes referred to as the three Bs: Blanc (white), Blond (fawn or red) and Brindled (dark brown). It’s kind of hard to describe so I’ll put pictures in the post on the website. Please check them out. I believe I mentioned, they are gorgeous. The arrangements of colors are really varied: Blanc is mostly white, sometimes called quail. The coat is scattered with very small patches of color; The Blond coat has one big fawn or red patch covering almost the entire cow’s body. The belly and head are white and there are those circles around the eyes with all of these coats I’m describing. The brindle is similar to the blond but the large patch is dark brown to black. The breed has been exported to many different countries, and has thrived in all of them. They adapt well to a wide range of climates. In South America, central Europe, Western Europe, Asia and North America the breed has shown its versatility. While having been exported worldwide, they received their greatest acceptance in South America where they were introduced in the 1890s. Total numbers there now exceed 4 million purebred plus countless Normandy cross breeds. Columbia alone has 1.6 million purebreds with the rest mainly in Brazil, Ecuador, Paraguay and Uruguay. They are also growing in countries such as the US, Mexico, Madagascar, Belgium, Switzerland, Great Britain and Ireland. Their milk has about 3.5% protein and 4.4% fat, with a 4.2% butterfat content. The reason their milk is so suitable for cheesemaking is because of high levels of Beta Casein and Kappa Casein. We’ll get into that more at a later date. In France, the Normande is associated with the production of famous cheeses such as Camembert de Normandie, Livarot and Pont Leveque (pone liveck). 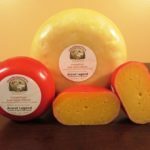 These are all moist, soft, creamy, surface-ripened cheeses. In France, to legally carry the official name the cheese must meet certain requirements for manufacturing location, type of cow, raw and/or pasteurized milk, and specific processes. The official Camembert de Normande is made entirely from raw milk from the Normande breed grazed in the Normandy region of Northwestern France. There are lots and lots of other cheeses from the Normandy region of France, but the three I mentioned require the use of milk from the Normande breed of cow. A Sustainable Breed for a Sustainable Agriculture. Since Normandy cattle have been raised on grass only for many centuries, their grazing ability is highly commended. Long, damp cold muddy French winters and simple forged diets have prepared Normandes for the worst. As I mentioned, today Normandes have spread from the Andes to the tropical coastlines of South America to Ireland and Canada. Because the Normande has not been selected solely on one character, it has retained exceptional qualities often lost by specialized breeding. Highly desirable qualities such as fertility, calving ease, excellent feet and legs and overall heartiness are prominent. Their thick, curly winter hair ensures good protection against the cold. The eye rings are effective against the sun in the summer. The breed also shows remarkable docility which makes the handling of bulls very easy, though you always watch your back. Finally, raised on grass for centuries, the Normandy shows outstanding grazing ability and that works for us. That’s it for your overview of this excellent breed of cow. I hope you enjoyed that little trip through French history. Learning new information is always a joy for me and I hope you were entertained as well. Crème fraîche is similar to sour cream. While sour cream and crème fraîche are both used to add richness and tangy flavor, they are not the same thing. And is it worth taking the extra time to make your own crème fraîche? I’m going to say absolutely, yes, depending on the use. Sour cream is made by adding lactic acid culture to heavy cream and sometimes milk to thicken and sour it. In France, crème fraîche was traditionally made from unpasteurized cream that naturally contained the right bacteria to thicken it. Since our cream is pasteurized here in the US, crème fraîche is now made by adding a fermenting agent with bacteria to heavy cream. So, today’s recipe will be the Americanized version of crème fraîche. When to Use Crème Fraîche? Use it anywhere you would use sour cream. Because sour cream has less fat but more protein, simmering or boiling it will result in curdling. 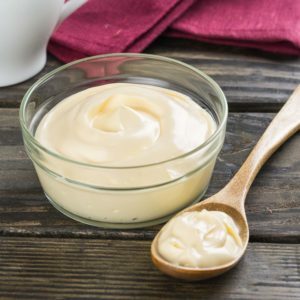 Crème fraîche is a better choice for sauces or soups. If using in a salad or as a topping, they’re pretty much interchangeable and the choice is yours — some people like the tanginess of sour cream, while others like the richness of crème fraîche. In a glass jar, combine the buttermilk with the heavy cream. Cover the jar tightly with cheesecloth or other breathable material. Let sit at room temperature (70 to 75 degrees) for 24 hours. Remove cloth, stir. It will be thick but will get thicker. Screw on a lid, and refrigerate for another 24 hours before using. That’s it for another episode of the Peaceful Heart FarmCast. Work continues on all sorts of farm projects. There is still more to do in the orchard. The garden will be picking up soon. That always adds a bit of hurried activity in the spring. We are looking forward to it. I hope you enjoyed the trip down memory lane and through Normandy, France. We plan to visit one winter when we are not milking our beautiful and gentle cows. 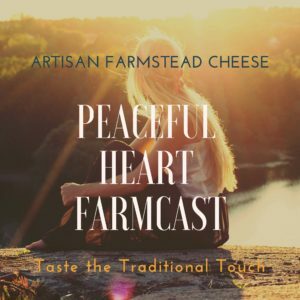 Visit us at http://peacefulheartfarm.com/recipes and download that creme fraîche recipe. It’s so fun and satisfying to make things with your own two hands. And in this case, so easy.